December 15, 2018 (Tony Cartalucci – LD) – A particularly scurrilous op-ed appeared in the pages of the Washington Post accusing the Syrian government of detaining, torturing, then executing an American citizen, Layla Shweikani. Considering US attempts to establish various pretexts to justify its ongoing military occupation of Syria and its attacks on Syrian forces – such an accusation could dangerously escalate the conflict if not checked and exposed. The article claims that the Syrian government’s civil registry recorded her death in late 2016. Claims that she died in Syrian government custody come from James Jeffery, the US special envoy for Syria Engagement, but the factual basis of this claim was not provided in the article, nor during recent testimony (video) provided by Jeffery to the US House Foreign Affairs Committee. I understand there are some classified details, but it is disappointing that Ambassador Jeffrey was unable to say more on behalf of the administration about what happened to Layla and what the repercussions will be when he testified before the House Foreign Affairs Subcommittee. … I’m still waiting on an answer. It is clear that Jason Rezaian among the pages of the Washington Post is accusing the Syrian government of detaining, torturing, and executing Layla Shweikani – and demanding accountability. 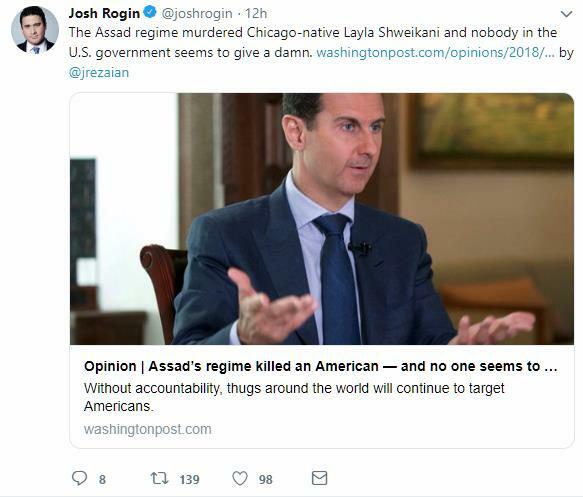 Completely absent from Rezaian’s Washington Post op-ed – however – was any actual evidence the Syrian government did “torture then executed” Layla Shweikani. …we don’t know the specifics of Layla’s death. I’d like to know much more. We should not jump to conclusions. Thank you for that caution. But the regime is responsible for her death, in their custody. Rogin would slink away from debate when pressed for an explanation as to how two experienced journalists like Rogin and Rezaian could “jump to conclusions” accidentally and how this was not just another example of the Washington Post’s larger, well known, and long-running war propaganda efforts. Part of Rogin’s diversions included references to the 2013 “Caesar photographs,” which Rogin would claim were “verified” by the FBI. US Representative Kinzinger is also fond of invoking the photographs which were allegedly smuggled out of Syria and reportedly depict Syrians “tortured then executed” by the Syrian government. What Rogin failed to mention was that the photographs were “verified” only as undoctored by the FBI who never once stepped foot in Syria to investigate or verify the identities of or circumstances surrounding those depicted in the photographs. The 2013 “Caesar photographs” also have nothing to do with evidence substantiating Rezaian and Rogin’s claims that the Syrian government “tortured then executed” Shweikani in 2016. Rogin also failed to mention that the FBI studied the photographs at the request of the US State Department – a US government department openly committed to the overthrow of the Syrian government. 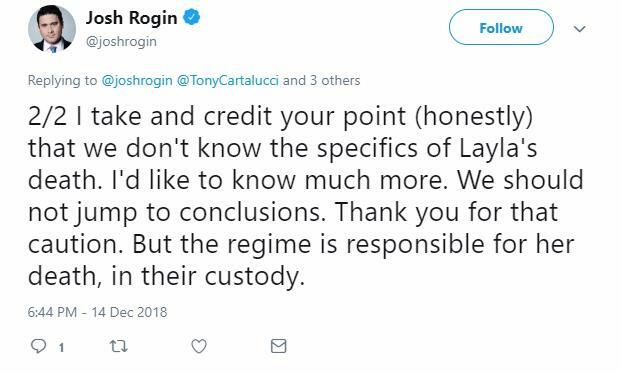 Surely a journalist of Rogin’s experience and stature understands basic concepts like “evidence,” “burden of proof,” and even “conflict of interest.” Yet it appeared that Rogin was systematically running through a list of unethical behavior to escape scrutiny for the Washington Post’s latest smear against the Syrian government and yet another attempt to establish justification for expanded US military intervention against Syria. Other Western media publications – such as the Independent in their article, “An American woman died in a Syrian regime prison. Could the US have done more to help her?” – admit deep within the bodies of their articles that all information regarding Shweikani comes from dubious activists relying on second and even third-hand accounts. What happened next was discovered by Idlbi through testimony of other inmates at Adra prison, where she was held, and contact with Syrian officials after the fact. Through an official, we found out that a judge sentenced her to execution for terrorism. The trial lasted 30 seconds. According to Idlbi, Shweikani was then transferred to the infamous Saydnaya prison, just outside of the capital. “Since then our assumption is that she was definitely killed. Because usually you are executed within 48 hours [of a verdict],” he says. That account matches the one given by the Syrian Network for Human Rights, which documents deaths in Syrian government custody. The monitoring group said it believes she was executed on 28 December 2016. Of course, the Syrian Network for Human Rights is a Western-funded (.pdf) opposition group and echo chamber of Western war propaganda, posing as an independent nongovernmental organization. This is not mentioned by the Independent who presents SNHR as a credible human rights advocacy group. The Independent also conveniently omits that Qutaiba Idlbi lives in the United States after receiving a scholarship to study at Columbia University. The Western media knows the average reader is not going to research who Qutaiba Idlbi is and learn that he is a member of the opposition – or that SNHR is an opposition organization funded by the very nations trying to overthrow the Syrian government. The Washington Post’s behavior illustrates several important points. First, it indicates that the US is still searching for pretexts to maintain – even expand – its illegal military intervention in Syria. It also illustrates that Western propaganda cannot stand up to even the slightest scrutiny. This was not a problem when newspapers and television channels controlled the flow of information. But with the rise of alternative media and growing skepticism and scrutiny across social media, this is no longer an advantage the permanent state’s media can count on. This explains the feverish attempts to control social media, manipulate search results, and even delete accounts. Rogin and Rezaian’s botched war propaganda campaign helps explain why the Western media and the special interests underwriting them have invested so much in eliminating competition and regaining the monopoly they once enjoyed during the era of print and broadcast media. Whether these investments will eventually pay off is another matter entirely.